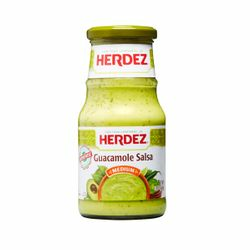 The New Guacamole Salsa by Herdez is good with chips as a dip and specialty Mexican dishes such as Tacos, Taquitos, Carne Asada and more. Guacamole salsa medium hot made with avocados, tomatillos and jalapeno peppers. 1. Heat oil in skillet. Add steak strips and flavor with Worcestershire sauce to taste until fully cooked. 2. Add red pepper until they soften, then add cOaxaca cheese and salt to taste. Once the cheese is melted, remove from pan. 3. Heat HERDEZ Flour Tortillas in a dry skillet. 4. Add cooked mixture onto the worm tortilla, then roll into a burrito. Top with HERDEZ Guacamole Salsa! 1 16 oz jar of HERDEZ Guacamole Salsa. 1. Heat 1 teaspoon oil in skillet. Add half sliced onion, fry until they reach a golden color, then add pork loin until fully cooked. Season with salt and pepper. 2. Repeat the same process with the chicken strips. 3. Heat HERDEZ Soft Tortillas in dry skillet. 4 Once tortillas are heated, add chicken and/or pork in the tortilla, top with lettuce, cheese, sour cream and HERDEZ Guacamole Salsa as desired. La Nueva Salsa de Guacamole de Herdez esta elaborada con aguacate 100% natural, tomate verde, cebolla, chile, cilantro. Picor alto.Te recomendamos la uses en: Tacos, Antojitos Mexicanos, Carnes y Platillos tipicos de Mexico. My wife accidentally picked this up thinking it was Herdez's Salsa Verde. Wow, what a great tasting salsa with just the right amount of spicy seasoning! It definitely surged to the top of our salsa products list. Oh, Jeanine from LA, how can you truly call yourself a southern cajuner if this salsa was too spicy for you? They must have placed too many tomatoes in the mix for your liking...HAHA! It is hard for me to keep enough on hand. Have had to research where to buy! My family loves it! Great taste, but would really like to have a mild version of the Guacamole Salsa instead of just medium. It was tolerable, but not my preference. The heat overpowered the flavor for me. O so good... Will be buying more for sure..
Great taste and does not go brown. Moderately hot but great taste. Keeps well without browning. Great!...but how about a mild? I was first introduced to this product in Monterrey, Mexico and it was excellent, I bought it here in Denver, Colorado when I got home problem is the version here in Denver was a lot spicier than what I had down in Monterrey, I am going to buy a bunch in Mexico when I go down there because the product here is just not the same! The U.S. version is bottled in California and I am guessing the Mexico version is bottled in Mexico somewhere. Don't get me wrong, it is still very good but the spicier version is not fit for EVERYTHING like the mild version is. ProsBoth versions are good but the U.S. version is not as universal in my opinion. ConsVersions of this salsa are different depending on where it is bottled. While a beautiful color, the spice level is at a habanero level.... no need for that in my opinion.... does not exactly taste like guacamole... mostly just a spicy mix. Consistency is loose and smooth... Herdez regular mild salsa is THE very best!! ConsToo spicy, little flavor other than the spice. Love this salsa, good bite to it, will continue to buy it. This is an identical match to a lot of "avocado salsa's" you might find on a taco truck. In MN this stuff is very difficult to find. But it's the best. 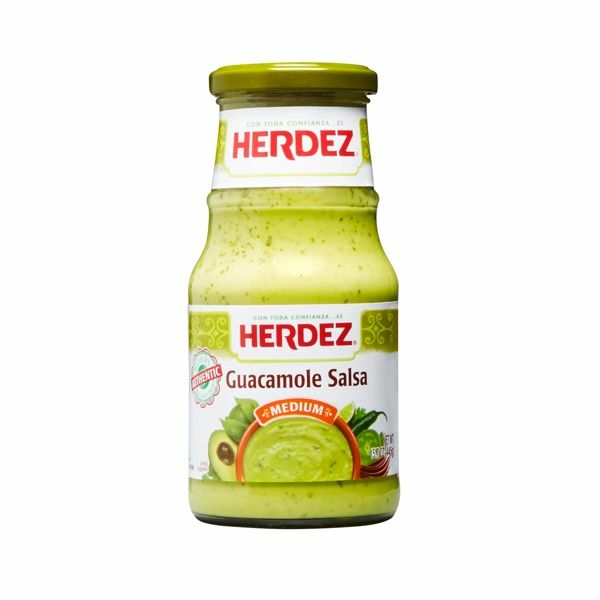 FIRST TIME I HAVE SEEN THIS IN LOCAL GROCERY TODAY SO I GOT SOME I KNEW IT WOULD BE GOOD THE HERDEZ BRAND IS THE ONLY ONE I GET AND THIS ONE IS THE BEST, ITS BETTER THAN WHAT THE RESTAURANTS SERVE I JUST WISH THERE WAS A LARGE BOTTLE LIKE THE SALSA VERDE, IT WAS BETTER THAN I THOUGHT IT WOULD BE. ProsEVERYTHING ABOUT IT. ITS THE BEST BRAND SALSA ON THE SHELVES AT THE LOCAL GROCERY STORE.